We have always offered our standard Variety pack which features 6 of our most popular picks, but have you always wanted to get your own pack of picks to sample a larger selection of what we have to offer? Well, now you can! This is also a great way to buy picks if you play with different styles, materials, ect.! 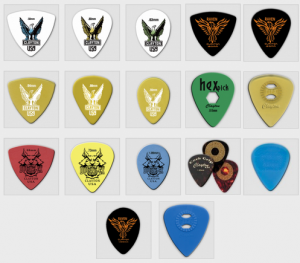 You can select 12 guitar picks from 9 of our most popular styles (featured below) and better yet you get to select the pick type, shape and gauge all just for $9.99 (plus shipping). Mix and match and discover your favorites, click here to buy now! 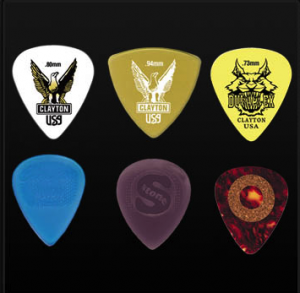 We have expanded our Acetal line of picks with 3 new shapes! We now offer our Acetal in Sharp Standard, Sharp Triangle, and Sharp Teardrop. Get an extra edge with these picks that are made from our renowned Acetal material. Strength is key to the ultimate performance. The composition of Acetal gives you just enough stiffness to give you those killer power chords, but has just enough give so that you’re not busting strings left and right. Plus this pick has a matte surface that prevents it from moving or slipping in-between your fingers. These are great for speed picking and fast riffs! We also offer them in all 8 gauges for each shape. 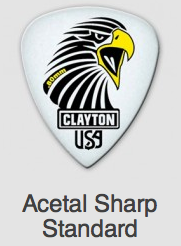 Check them out here http://steveclaytonstore.com/product-category/guitar-picks/acetal-sharp/. 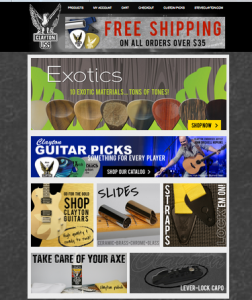 As a company that specializes in guitar picks and custom picks, it is sometimes overlooked that we have many other amazing guitar accessory products to offer! One of these is our Brass Socket Slide. 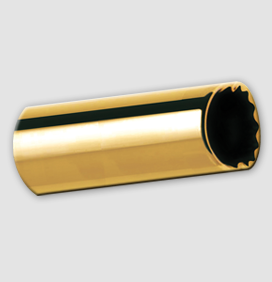 This slide has the same type of ridged interior that would be found in a tool socket, which musicians have been known to use in lieu of a guitar slide because the ridges keep it locked on your finger. However, actual tool sockets tend to be heavy on one end, so Clayton USA came up with the Socket Slide solution! With equalized weight on both ends of the slide, the result is consistent balance, weight, and tone. 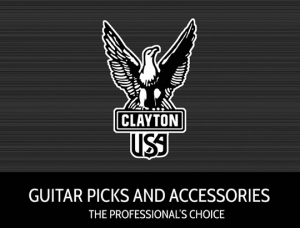 Specifically, Clayton USA chose to make the slide brass for enhanced quality and sustainability of the tone. Plus, as if this weren’t enough, a cut-out relief has been added for extra comfort while playing. Check out these amazing slides and order one today at http://steveclaytonstore.com/product/brass-socket-slides/! If you are a fan of Tenacious D then you definitely have to try out the functional guitar picks from their movie Tenacious D and The Pick of Destiny! These picks are an exact replica of the one from the pick necklace Jack Black wears in the movie, only you can actually play with these! Since they are such a popular item we had to extend the line to include thin, medium and heavy gauges so you are sure to find one that fits your ideal thickness. 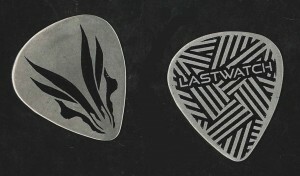 Also, even if you aren’t a fan of the movie they can add some variety in your playing style with the three different edges this unique pick shape has and it is made of Delrin for ultimate strength. What are you waiting for, you can buy a pack straight from our store and earn 7 loyalty reward points! 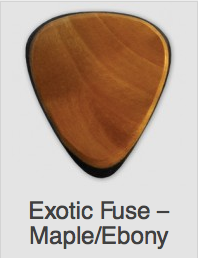 Have you had a chance to check out the newest pick in our Grip Pick line? Just added to our product offerings this year, Hex Picks have proven to be very popular with seasoned guitar players. These picks have a hexagonal-shaped hole placed right in the center, which locks it into place while playing, but will still allow you to move the pick in your fingers if needed. 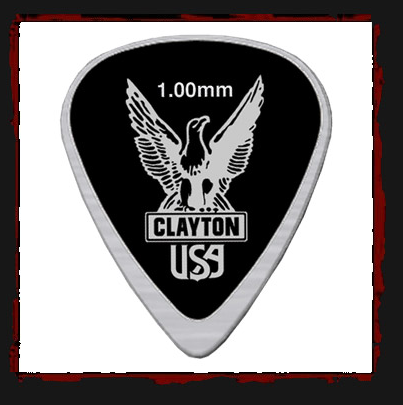 Made of the same material as our Duraplex Picks, you will find them to be comfortable and produce the high-quality tonality that you have come to expect from Clayton USA brand guitar picks! 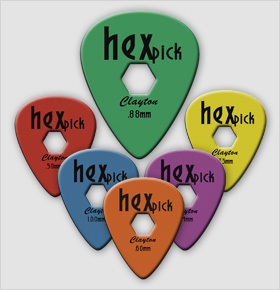 Order your new Hex Picks today at www.steveclayton.com/hex-guitar-picks.php! Hey Clayton Fans! 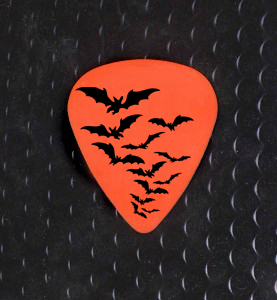 Just a post to remind you that, even though we specialize in making guitar picks and custom picks, we do offer other amazing guitar accessories! 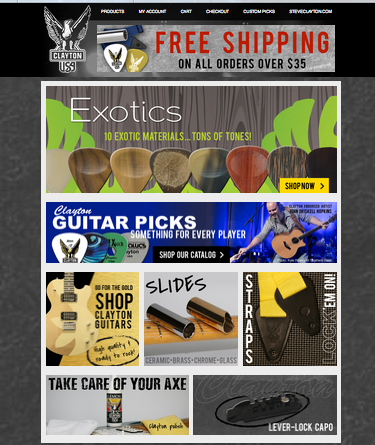 These guitar essentials include polish products, and we offer two different types! The other polish that we offer is called Pro Shine. 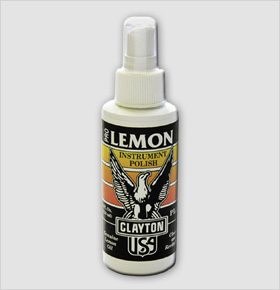 This cleans and finishes your guitar with a beautiful shine without any build-up. It is non-toxic and is made from all natural and organic oils. Don’t forget to have a look at our Pro Buff and String Zip cloths as well! 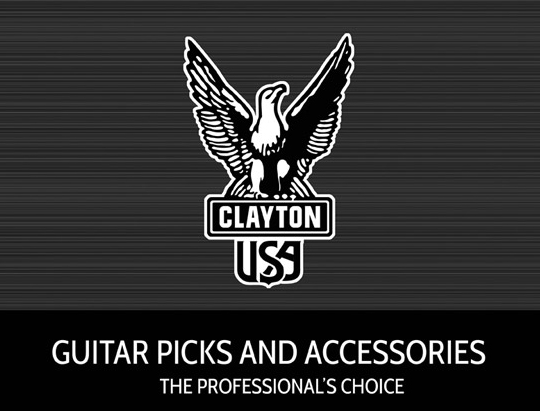 Over the years, Clayton, USA has added more and more pick options to our custom guitar pick line. I have realized that, currently, we offer five different white guitar pick options for custom printing, and some of you may be wondering which white pick material will be best for you? Here is a quick guide to help you out! 1. White Delrin Picks: These are basic, bright white picks, similar to tortex material. They have a semi-gloss finish. They work best with dark, bright, and bold colors for custom designs. Black print is the best for this material. 2. 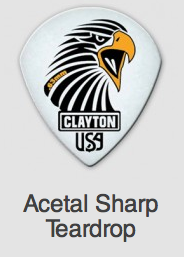 Acetal Picks: Some customers choose acetal for custom picks because they have already tried our regular Clayton acetal picks and love them! Acetal picks are professional grade; known for having an excellent grip to them. They work well with a variety of colors for designs, as long as the shades are not too light. They are semi-transparent, so you want to keep this in mind for two-sided designs. They also can support full bleed backgrounds (except black) and photos. 3. Eco Picks: Eco picks are playable guitar picks, though they are not as durable as some of our other materials because they are a biodegradable plastic. However, if you are getting picks purely for promotional use, or give-aways, they are awesome because they can support absolutely ANY artwork. We have done photos, light color shades, high detail designs, and full coverage backgrounds, and they always turn out beautifully on Eco material! 4. 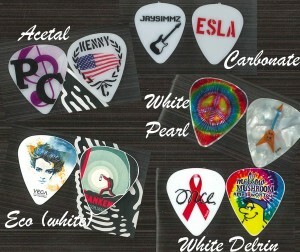 White Pearl Picks: Our white pearl material is distinctive because it is marbleized, and has a glossy finish. These picks also work great with a wide variety of colors and can support light color shades (even light grey). You will just want to be aware that the marbleized quality will show through in the design that is printed on them (unless it is black print). 5. Carbonate Picks: Carbonate material is plain white, like white delrin, but with a gloss finish like white pearl. Carbonate, like white delrin, works best with bright and bold colors for the designs. We offer carbonate picks as our less-than-100 pick option… You can get custom carbonate picks in sets of 30 or 60, while our other white pick options have a minimum order quantity of 100. 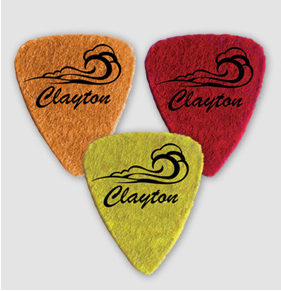 To order your custom guitar picks, visit www.claytoncustom.com today! 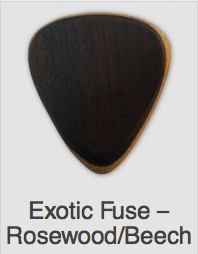 Check out these awesome faux-wood custom guitar picks! One of our fabulous Clayton customers placed an order for custom picks with a design that had a wood background and the silhouette of a gecko on it. We determined that the design turned out the best when printed on our Eco pick material. The crazy thing is that when they have the wood print on them they actually feel like wooden picks! The consistency of the Eco material is like that of a light wood material. We thought it was so cool that they turned out that way! Also, the overbleed option was used so that you can hardly tell that the pick is white underneath the print. 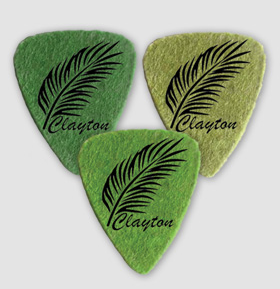 To order your own custom guitar picks, visit www.claytoncustom.com. 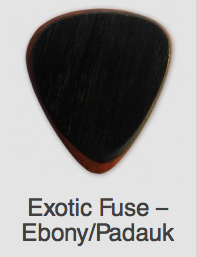 Eco picks are new to our custom pick line; give them a try! 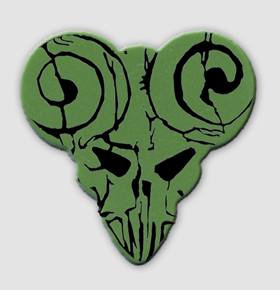 The design for these guitar picks immediately caught my eye because of the detailed art and fearless use of color. Instead of having the text and grim reaper logo in just a simple black on white, the customer chose to have these picks really catch the eye! The design was made on our carbonate guitar pick material. Carbonate is one of the newer materials available in our custom pick line. The picks are bright white, with a glossy finish, and we have found that they work very nicely with bright colors, which is why this design turned out so well. 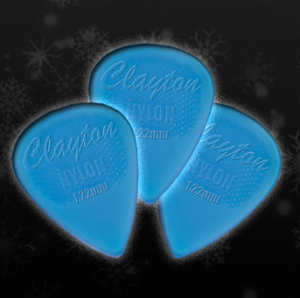 To order your own custom picks, visit www.claytoncustom.com ! 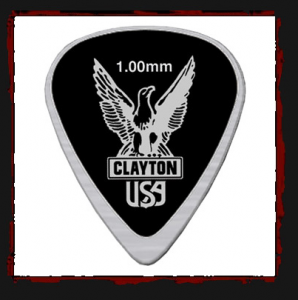 Are you looking for the quality of pick that you have come to expect from the Clayton brand, but with some extra attack for those speed riffs? Look no further than our Clayton USA Spike series. Available in 3 different shapes and 3 different gauges, these picks possess extra sharp edges and pointed tips that will allow you to get that killer attack you’ve been dying to unleash. Also, the Spikes are made out of the same pick material as our Ultem Gold series, so that you know they have the strength to stand the test of time, even after endless nights of hard-core rocking out. 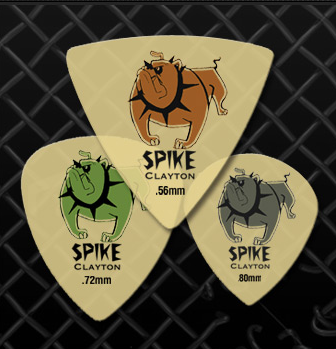 To order your Spike picks, visit http://www.steveclayton.com/spike.php today! Pro Lemon is an oil-based shine. 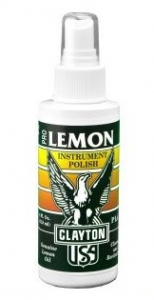 It can be used to polish your guitar or piano, even your furniture, and condition your fret board. 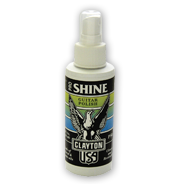 The Pro Shine guitar polish is special, as it will not lead to any wax build-up from continual usage. Both are non-toxic. Be sure to shake guitar polish before applying. Both products offer the same high quality finish for your guitar; it is just a matter of personal preference for which one is chosen. To order your Pro Lemon or Pro Shine polish, visit http://www.steveclayton.com/polish.php today! Both items are available for only $4.98 per bottle! Hey Clayton fans! 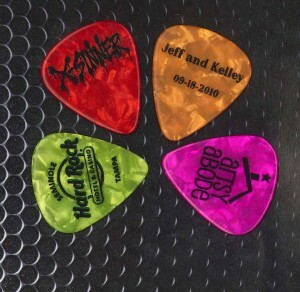 For those of you that order custom guitar picks from us and are in a band, you should let your band’s drummer know that we also offer custom drumsticks! Starting at just $44.00 for five pairs, they are a bargain because they can be printed with any custom design! We offer both single and full color print options. 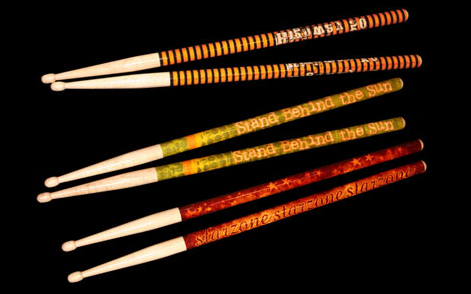 Custom drumsticks make great personal keepsakes for drummers, or novelty items for fans! They are made out of professional quality American hardwood, in size 2b (16 inch length). To start your order, visit our site today at http://www.claytoncustom.com/drumsticks/cart/index.php! Our colored pearl custom guitar picks can make an especially unique holiday gift. 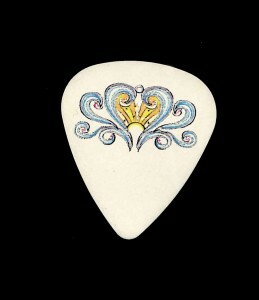 This is because, along with being able to customize the design of the pick, you can also choose the color of the picks! The colored pearls are custom color matched, so you get to choose from a huge palate of colors when you place your order. Shown below are some examples. If you think that colored pearls might be the perfect gift for the musician in your life, the time to start designing your picks is now. They take about 3-4 weeks to produce, and you will also want to plan for shipping time. So don’t delay! Place your order at www.claytoncustom.com! If you read our post from September 21st, you will know that we recently added our Metallics picks to the material options for custom printing! Below you will see an image of a couple of the designs created by the first customers to order custom Metallics guitar picks. Both of the designs shown here were done on the Stainless Steel Metallics, but we also offer Brass and Copper for color choices. All three types are solid metal with a brushed surface to enhance the grip of the pick. Any of the types can be printed with black ink, and they ship out within approximately 72 hours after order placement. They make for a wonderful holiday gift! Order your custom Metallics picks today at www.claytoncustom.com! Looking for a premium pick that will stand the test of time? 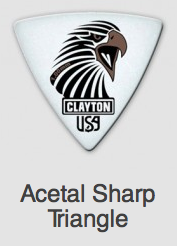 ZZ-Zinc picks are a new Clayton item that was added to our product line this year! These picks are crafted out of genuine Zinc alloy metal. They are made for producing tones that are clear and high, along with punchy bass and unprecedented volume, due to their heavy mass/metal composition. 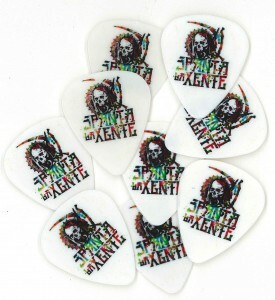 These picks are popular amongst electric, acoustic and bass guitarists alike. To help maintain grip on the picks and prevent slipping since they are metal, we have added a matte finish and a reversed embedded epoxy logo. 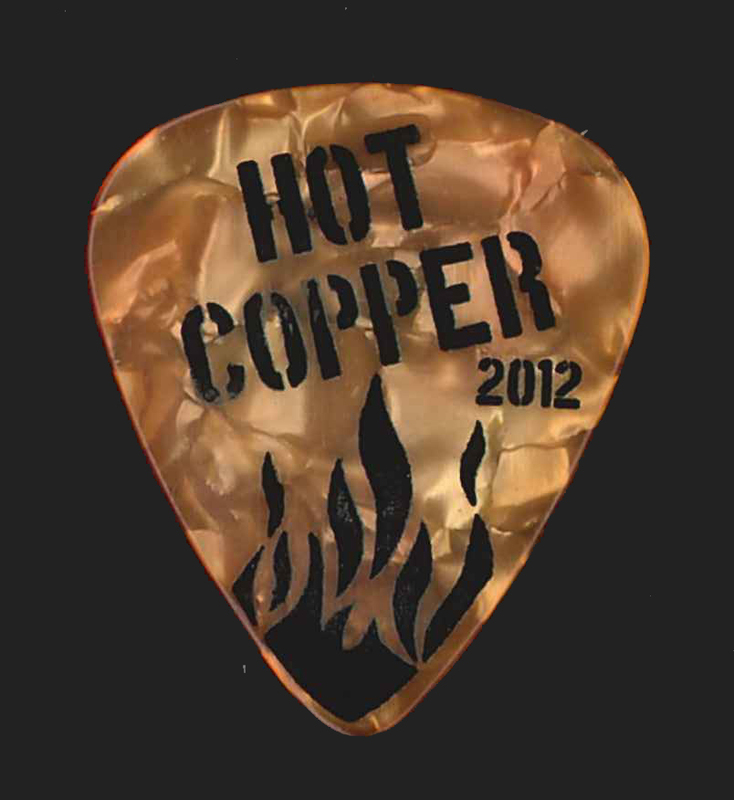 These are heavy-duty picks that are designed to last throughout years of guitar playing! They are available in both a 1.0mm and 2.0mm gauge. 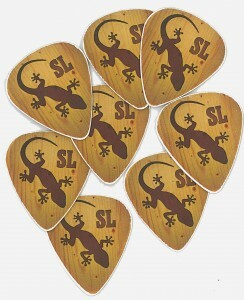 To order your own ZZ-Zinc premium picks, visit http://www.steveclayton.com/premium.php today!